Increase employee productivity, ensure processes are transparent and lower your storage costs. Does finding documents take too long? Is the cost of storage for Salesforce CRM too high? Do you also want to make documents available outside of Salesforce? 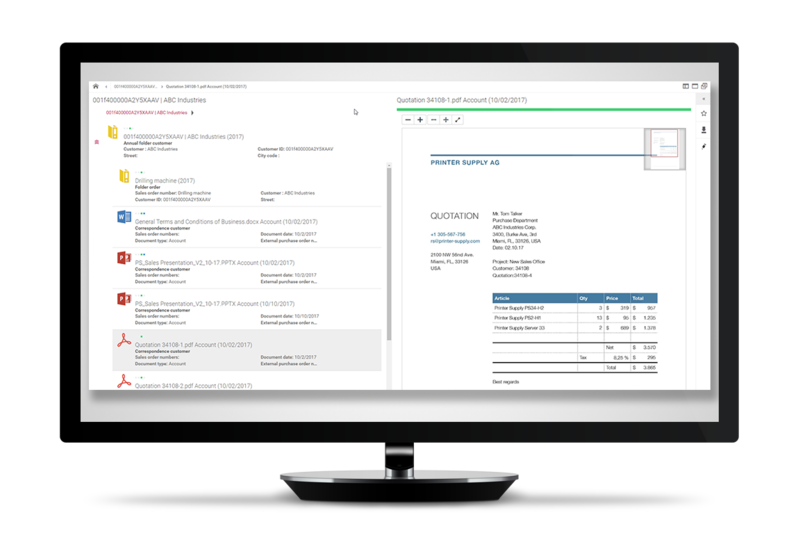 Optimize your processes with quicker and easier access to your documents directly in your trusted Salesforce user interface. Always have access to the most recent and relevant document. Document versioning keeps you up-to-date and helps to prevent errors due to obsolete information. Even colleagues who do not use Salesforce can access the document management system. Make Salesforce the ultimate information hub in your company – thanks to d.velop documents for Salesforce.. Documents contain information that is critical to your business. You can now find them quickly and use the important knowledge gained to enrich and optimize your processes. Data storage costs money. With d.velop documents, every employee receives 10 GB of free storage space. By using Amazon Web Services, we are able to provide significantly lower storage costs. Tax-relevant documents must always be stored in compliance with legally binding record keeping requirements. With d.velop documents, your documents are archived in compliance with the German accounting principles set out in the GoBD. One click and a document can be accidentally deleted. Secure archiving ensures that important knowledge is protected and retained. 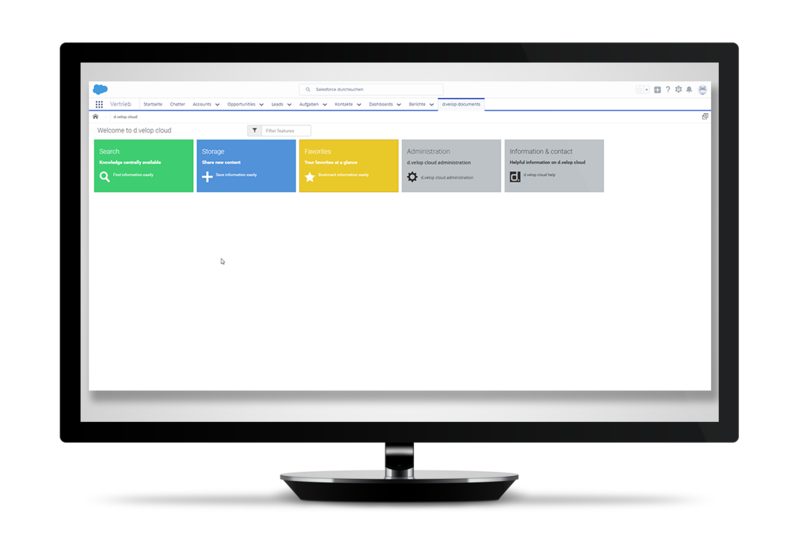 d.velop documents integrates seamlessly into Salesforce. All its functions are intuitive and easy to use. This ensures not only increased productivity but also satisfied staff. To create integrated processes, you can also now access documents outside of Salesforce via your web browser, because not everyone has a Salesforce license. We chose d.velop documents because we wanted to simplify and accelerate our processes. Our goal was to achieve a high rate of user acceptance. 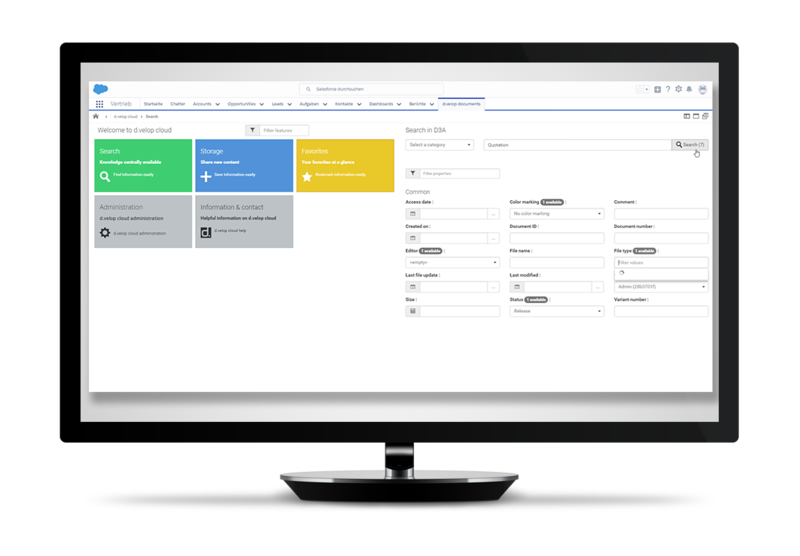 As a result, a key criteria in our decision making process was that the document management solution needed to have the look and feel of a native Salesforce application. d.velop documents fulfils that goal extraordinarily well. Try it now for free and get started immediately. per user and month plus VAT. - this is what it looks like. A customer dossier is automatically created for each of your accounts. This dossier forms the logical container for all your customer-specific documents. 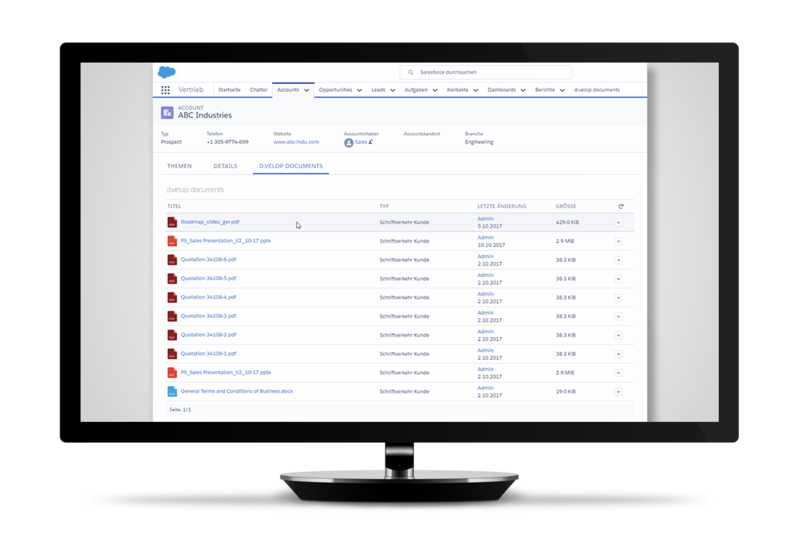 You benefit from a comprehensive document management system with enhanced search and filter functions, all directly available from within Salesforce. You can also create complex search queries in the document management system. Document content is also searcheabke thanks to full text indexing. The repository integrates seamlessly into Salesforce. An example_ Access through Accounts and Opportunities. The repository is generated automatically when you upload files. Store documents in compliance with the GoBD using the upload function or drag and drop.